In partnership with Markham Museum, Glasstronomy Studios has created an art glass exhibit to coincide with International Women’s Day on March 8, 2019. Using reclaimed window frames and a variety of art glass techniques, Glasstronomy Studios, its membership, and student volunteers have collaborated on a tribute to a diverse group of women who share an independent spirit and a disregard for social barriers. Challenge your perception of how we lived in the past, exist in the present, and project for our collective future. Whether celebrating International Women’s Day, or looking for perspective, visit Markham Museum from March 2 to 31, 2019. The Studio team will be in Vegas for next year’s 25th anniversary show. We will be bringing along some of our members so they can take in the experience, participate in some workshops, and have a jolly good time! 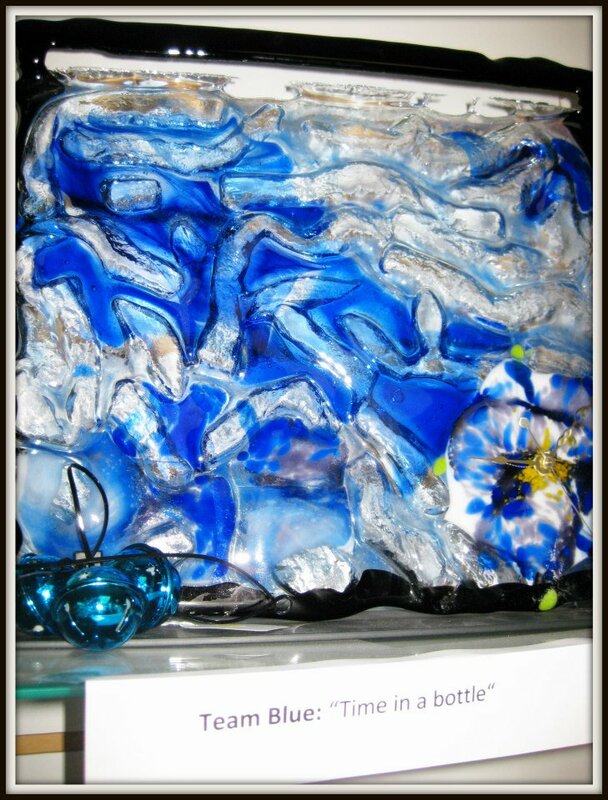 For more about the show, visit: glasscraftexpo.com. Click here for information about Melanie’s workshops in Vegas. OGT announces a rebrand for former Spectrum and Uroboros glass: Oceanside Compatible and Oceanside Art Glass. Oceanside Compatible will take the place of former stained glass and 96 COE glass for colours where both previously existed. That is, there will be one format for both purposes. While there are a lot of benefits from a manufacturing point of view and for those of you who are fusers, the traditional stained glass practitioner will now be paying a premium. The advantage for those of you who do both stained and fused glass is that your stained glass scraps will now be usable in fused glass applications. Oceanside Art Glass refers to the architectural stained glass that is not 96 COE compatible. So as always, be careful how you store/label your glass. OGT is also “retiring” some glass. While that sounds permanent, OGT indicates that they will be reviving some of them after the technology and production issues get worked out. From our perspective, OGT is doing things right. As they are manufacturing a base product they use themselves, they are putting effort into ensuring its stability and longevity. This takes time. Reducing inefficiencies, like duplication of glass, will eventually allow for more types of glass to be developed and made available to us all. For more information on OGT’s branding strategy, click here. For OGT’s clarification on the above, click here. This includes an update on irid production, explanation of retired product list, branding, and what to do with fusible scrap leftovers. On this side of the border the release of Oceanside glass has been slower than anticipated. One thing is crystal clear, prices will be going up to reflect “fair market value”. Click here for their latest update. OGT will continue with Spectrum’s previously planned discontinuations, as well as removing other glass from production so that they can focus on creating stock of popular products as well as introducing new colours. If you were one of the people that took the time to do an exploratory survey for Bullseye last fall, you will be disappointed to know that they have chosen not to invest in 96 COE glass development. Not surprising really, as their main industry competition have been given a lifeline through Oceanside Glasstile. After a year of upheaval, Bullseye is looking forward to 2017. Click here to learn more. Uroboros Glass has taken a page from Spectrum Glass and has been sold to Oceanside Glasstile (OGT). Production of your favourite glass products will transition from the current Portland facility to OGT’s operations in Tijuana, Mexico, by May 2017. Click here to learn more. Wow, what a difference one week makes! Uroboros Glass has announced that it will discontinue operations in early 2017. They are looking for a buyer, so if you have a few million US dollars on hand, you may be able to get in on a good deal … that is if you can relocate somewhere less “gentrified” and without the environmental regulatory scrutiny that has stifled the company. Of course, if you have the scruples of Bill Gates, meet the necessary codes, keep on the staff, and re-brand as the Eco-friendly Glass Company. Click here to view the announcement. Uroboros Glass has been very transparent regarding their safety and emission issues. They are now indicating they will be able to resume full production as of January 1, 2017. Click here to view the announcement. Thought you heard the last of Spectrum Glass Company? Some of your favourite glass may be back on the market via Tijuana, Mexico. Spectrum Glass Company has just finalized the sale of Spectrum® Glass, their System 96® brands, equipment, and formulae to California-based glass manufacturer Oceanside Glasstile. Click here to view the announcement. Elizabeth was commissioned by The National Ballet of Canada to create the awards for this year’s winners of the Rolex Dancers First awards. For the third year in a row, recipients each received a sculpture derived from her Optics series. Congratulations to Piotr Stanczyk and Hannah Fischer for their performances in The Winter’s Tales! For more information on the awards and presentation, see the news release published on September 19, 2016. Uroboros Glass has been quick to respond to the Spectrum Glass Company closure. As a partner of System 96 they are positive that they can ensure the availability of sheet glass colours and byproducts (frit, stringers, etc.). Click here to view their outline of their short-term and long-term glass production plans. Stay tuned, folks! Those of you who participate in glass craft and industry forums will already be aware of a new challenge on the art glass horizon: Spectrum Glass Company has decided to end operations over the next few months. Click here to view their press release. We are deeply saddened by this news but look forward to positive changes in the industry. Uroboros Glass is working with US environmental regulators on a long-term emissions control agreement. Once they have their updated equipment in place they expect to resume full production of their own colour line as well as to start production of the colours previously made by Spectrum. It’s time for a creative industry to get creative – The art glass industry has survived over 5000 years (yes!) of war, plagues, recessions, and government red tape, and will continue to evolve. Glasstronomy Studios looks forward to the creative product improvements, new colours, and innovations that will enhance our own art glass work and the direction we take in our education and creative services. Our priorities are as ever to our operations and our membership. As always, we welcome your take on the current glass scene and thank those of you who have shared your concerns with us. Do NOT panic! Do not reach for the phone and order every piece of glass you can think of. Our wholesalers continue to get shipments of glass as quickly as they can be expedited. US state and federal environmental regulators have requested that Uroboros Glass suspend the use of cadmium and chromium colour agents in their glass furnaces. 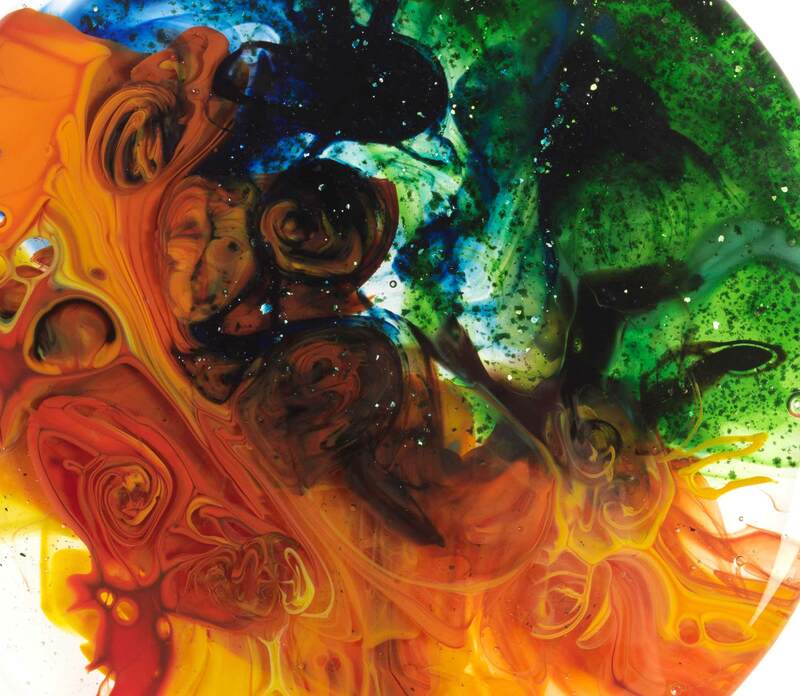 This affects 65% of their stained and fused sheet and powder glass lines and means that most reds, and all orange, yellow, green, and black colors, as well as some browns and purples will no longer be produced in the existing formulas. The bottom line is that for both consumers and suppliers, some of your favourite glass sheets, powders and frit will only be available in limited quantities and at higher prices up and down the retail chain. We are confident that Uroboros Glass will be able to make adjustments to their formulas and get back into production with equal or better colour options. Elizabeth was commissioned by The National Ballet of Canada to create the awards for this year’s winners of the Rolex Dancers First awards. For the second year in a row, recipients each received a sculpture derived from her Optics series. For more information on the awards and presentation, see the news release published on September 22, 2015. Elizabeth was commissioned by The National Ballet of Canada to create the awards for this year’s winners of the Rolex Dancers First awards. The recipients each received a sculpture derived from her Optics series. For more information on the awards and presentation, see the news release published on September 23, 2014. Our friends at Hollander Glass Canada are undergoing an interruption in their operations. We are saddened to see them suffer and hope that things will resume under new ownership. We send all their staff our very best wishes. Glasstronomy Studios aims to support Canadian businesses as well as provide quality product to our customers. We will continue to meet the needs of our clientele with our diverse and creative business practices. We look forward to serving you now and in the future. Elizabeth and Melanie spent a whirlwind five days in Las Vegas at the Southpoint Hotel, Casino, and Spa. Both participated in some excellent workshops instructed by well-established artists. Melanie had workshops with Janet Schrader, Peter McGrain, and Michael Dupille. Elizabeth was particularly impressed by Phil Teefy’s intensive two-day casting workshop. Lots of tips and tricks were learned and will be applied to our own work. On the floor we saw the latest products, some of which we brought back to share with our members and customers. 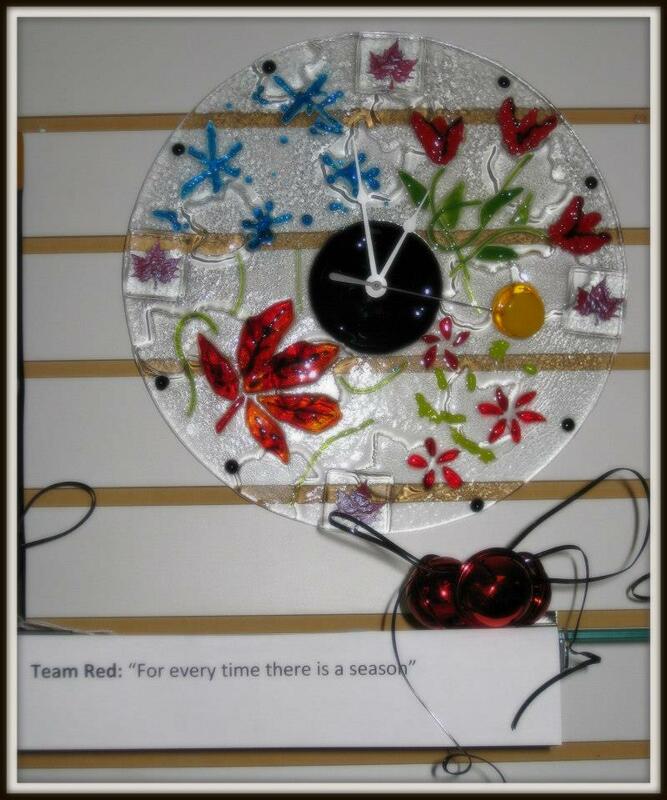 Congrats to Melanie for coming in first place in the intense four-minute Glass Cutting Competition: Advanced category. It was a bloody event, but no stitches necessary! 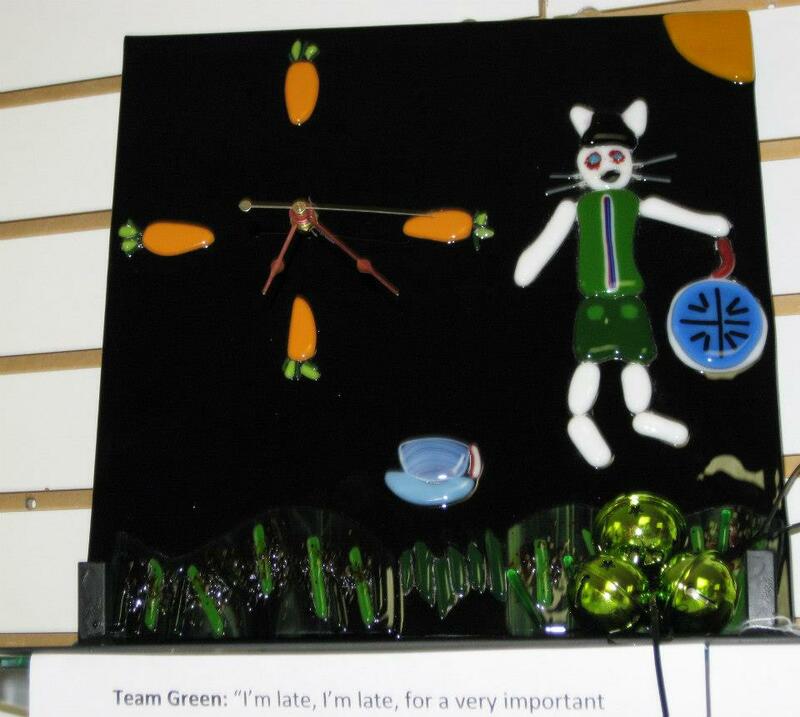 Congratulations to Team Green for winning the popular vote for their piece, “I’m late, I’m late, for a very important date”. 3. visit the studio and fill out a ballot. So, shall it be Team Blue, Team Green, or Team Red? The winner will be announced at our upcoming members’ social event on December 13. Thanks for your participation. September 30, 2012 is looking to be a milestone for Glasstronomy Studios. We officially open our doors and look forward to connecting with old friends and associates as well as making new acquaintances. We appreciate the interest and welcome your feedback.